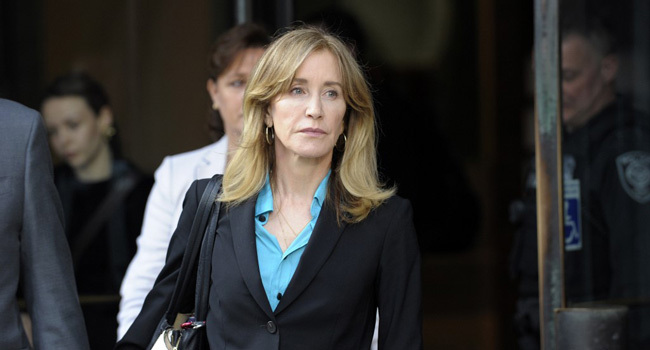 Huffman’s equally famous husband, actor William H. Macy of “Fargo” fame, was not charged in connection with the college admissions scandal. The Boston Globe said that as part of a plea agreement, Huffman’s sentencing guidelines would be between four to 10 months in prison and prosecutors would recommend she serve the “low end” of that scale. The newspaper also published a statement from Huffman in which she apologized for her actions. “I am ashamed of the pain I have caused my daughter, my family, my friends, my colleagues and the educational community,” she said. “I want to apologize to them and, especially, I want to apologize to the students who work hard every day to get into college, and to their parents who make tremendous sacrifices to support their children and do so honestly. Another television actress, Lori Loughlin, known for her role on “Full House,” has also been charged in the case but did not enter a plea on Monday. Some of them paid as much as $400,000 to get their child into the college of their choice.